Ulrika Blom is Country Director of the Norwegian Refugee Council in the Democratic Republic of the Congo. She has worked in the country for five years. GOMA, DR Congo, Oct 26 2017 (IPS) - Late last week, the humanitarian community activated a Level 3 emergency for the Democratic Republic of the Congo (DRC). This trigger in the global humanitarian system is seldom used, and only after serious deliberation by the top echelons of the UN system. The alarm is uniquely activated for the world’s most complex and challenging emergencies. It is decided on based on five criteria: scale, complexity, urgency, capacity and reputational risk. It calls for the entire humanitarian system to scale up and respond to colossal needs. Today, only three other crises are recognized as system-wide Level 3 emergencies: Syria, Yemen and Iraq. DR Congo has joined a club no nation actively seeks membership of. The central African nation passed a tipping point mid-last year when it recorded the highest increase of newly displaced people in the world. While the country’s Kivu provinces in the east have long been plagued by conflict, Grand Kasaï in the southcentral region saw widespread violence erupt. Almost a million people fled their homes across the country in 2016. 2017 has shown little sign of improvement. Another million people have been displaced so far this year, largely because of continued violence in Kasaï and the escalation of inter-communal fighting in Tanganyika province. 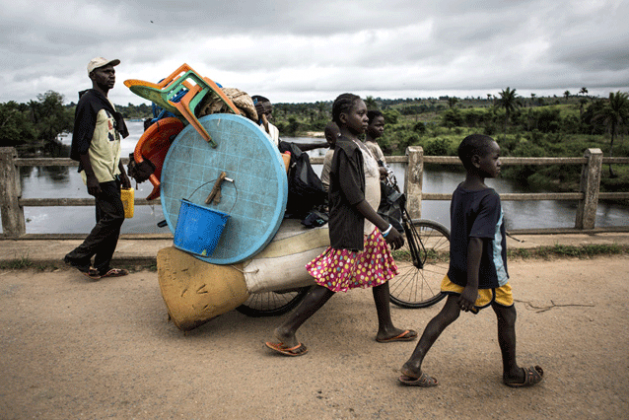 An additional 100,000 Congolese have fled to neighbouring countries as refugees. A dangerous thread flows through these crises – shocking levels of violence-related displacement, destruction of homes, attacks on schools, child-soldier recruitment and widespread humanitarian needs. It’s a toxic mix that has stretched the country’s humanitarian system to its limit. The Level 3 emergency was activated on 20 October across DR Congo, with a focus on Kasaï, Tanganyika and South Kivu provinces. Violence in Kasaï, Tanganyika and South Kivu has displaced millions over the past year. Close to 4.3 million people in these areas are estimated to face crisis or emergency levels of food insecurity. The United Nations warns that further displacement is likely in these regions, as widespread armed group activities, unrest and violence fueled by ethnic and political conflict, affect many areas. All this takes place against the backdrop of one of the world’s largest humanitarian crises. At least 8.5 million people across DR Congo need assistance and protection. Close to two million children are at risk of severe acute malnutrition. Disease outbreaks, including cholera, affect tens of thousands of people each year. Aid organisations have asked for USD 812 million to respond to the crisis in 2017. That’s only USD 109 per person we want to help. Despite this, the aid appeal is just 32 per cent funded almost 11 months into the year, making DR Congo one of the most underfunded crises in the world. The Norwegian Refugee Council was one of the first international aid organisations to respond to the crisis in Kasaï this year, providing food and school support for tens of thousands of people in need. Today, along with other relief agencies, we face the very daunting task of addressing immense needs on the ground without the capacity to properly respond. The recognition of DR Congo at the highest level of emergency will hopefully turn global attention, funds and resources towards the crisis. But it’s paramount that existing funding is not shifted around the country. New money needs to come in. For example, North Kivu province hosts the largest number of displaced people the country – close to a million. However, the region is not included as an area of focus in the declaration of the upgraded emergency. While North Kivu may not have the same level of recent violence as the Kasaï region, the conflict’s unpredictable nature means this could change quickly. Resources coming into the country must be flexible so we can put them to use where needs and gaps arise. Countless lives depend on it. DR Congo is a textbook example of what can happen when a crisis slips off the international radar. This cyclical conflict has decimated the country for decades. In the past few years, donor attention has waned and been diverted to emergencies elsewhere in the world. Protracted crises need long-term commitment. We should acknowledge the Congo case as evidence of this. Our lack of action today will result in further hardship for millions of Congolese tomorrow and for generations to come. The international community must mobilize now to help those who have suffered in silence for too long.